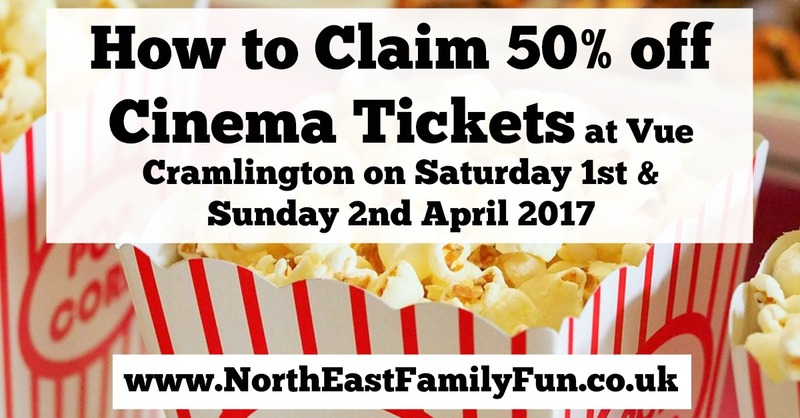 If you live in Northumberland, you can receive up to a 50% discount on cinema tickets at Vue Cramlington during Northumberland residents' festival on 1st & 2nd April 2017. It is practically unheard of to receive discounted tickets on a weekend so it's an offer not to be missed! Up to 50% off peak adult tickets with Festival voucher. New Multiplex Cinema in the heart of Northumberland, based in the Manor Walks shopping centre in Cramlington. Discounted tickets for residents who show the voucher when purchasing tickets, valid only Sat/Sun in standard showings. Supplements apply for 3D, VIP and Extreme. Not valid for advance purchases. Cinema Manager’s decision is final. Please bring proof of residence with you as you may be asked to produce this. A driving licence, utility bill or bank statement will be accepted. Please note - offer is subject to availibity and can change. I also expect it to be super busy so I'd head to Vue first thing in the morning to increase your chances of getting discounted tickets. For more ideas for discounted days out across the North East, follow North East Family Fun on Facebook here. Don't forget to share this deal with your friends. This is excellent. I love going to the cinema but it's always so expensive. Me too - I hope they don't just bring all their old films out! haha! What a find! The cinema is so bloomin expensive, I dread to think how much an entire family costs now! Thanks for sharing!